A properly diversified investment portfolio will hold a variety of investments across different asset classes. This leaves you less exposed to events that hit a particular asset class. Assets that carry higher risk should deliver higher returns. They are also likely to have far more volatile returns and should sit in the growth part of your portfolio. For the defensive part, you need investments that provide capital-stable returns and predictable income. Fixed income investments like Government bonds, TDs, corporate bonds and XTBs over them offer that defensive investment profile. The returns from individual government bonds and corporate bonds are now accessible on ASX in the same way as shares, ETFs, and A-REITs. Government bonds returns are available via CDIs (Chess Depository Interests) and corporate bonds as XTBs. 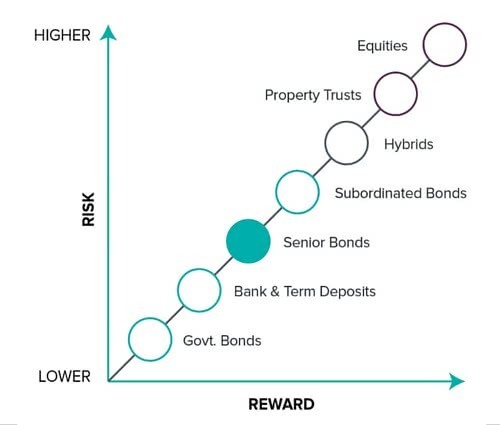 Australian Government bonds are the safest investments in Australia on the risk/reward spectrum. The federal Government currently has a AAA credit rating and its bond yields are generally seen as the ‘risk-free rate’ in Australia. The probability of the government defaulting is seen as minimal. Government bonds were once only available to wholesale and sophisticated investors, but investors can now buy and sell them on ASX as CDIs. They do not have the ability to raise taxes to pay interest – so their bonds are inherently riskier than government bonds. Corporate bond yields tend to be higher than government bond yields reflecting the greater risk in lending money to a company. Both government and corporate bonds are loans to an issuer with fixed maturity dates and coupons paid at regular intervals. Australian Government bonds are fixed-rate or indexed to inflation, whereas corporate bonds can be fixed, floating-rate or inflation-linked bonds. The government bond market in Australia is significantly larger than the corporate bond market and there are a wide range of government bonds on issue. State governments also issue bonds, these are not available on ASX. A key difference between government and corporate bonds in Australia is the range of maturities available. Corporate bonds tend to have terms between three and seven years, with a few ten-year bonds available. The range of Government bond tenors goes out to 30 years. For investors considering government bonds, this much longer term to maturity is very important. Longer-dated bonds have much greater interest rate risk than shorter-dated bonds. Interest rate risk is the risk that interest rates increase and the price of a fixed rate bond falls. Similarly, if interest rates are cut, the price of fixed-rate bonds rises. Interest rate risk is also known as ‘duration’ risk, because the concept is linked to the term of a bond. The duration of a fixed-rate bond is an important dynamic measure of a bond’s performance: it is the change in price expected for a given change in yield. A change in a bond’s yield is commonly driven by a change in the RBA cash rate, currently 1.5%1. Note, the price of the longer-dated bond is far more sensitive to the rate change than the shorter-dated bond. Duration is the measure of how sensitive bond prices are to yield changes. A key driver of duration is the term to maturity of the bond. With government bond terms of 10 years to 30 years, investors need to be aware of this impact, particularly for these longer-dated bonds. The 30-year bond yield may appear attractive at 3.25%2 compared with a 6-month TD rate of 2.2%3. But that’s comparing chalk with cheese as you get your money back in six months from the TD, but in 30 years with the bond. If you can’t say definitively that you will hold the bond until 2047, then you are going to be selling the bond before it matures. Given the bond’s duration of 20, you need to think where rates might be at the time you need to sell. Consider how hard it is for the army of analysts and economists to predict where rates will be in 3 years, never mind over the next 30 years. Large Superannuation funds that need to pay retirees in 30 years’ time, find these sorts of investments very attractive. If you’re in your 30s and thinking of buying them for your self-managed super to draw down in 30+ years, then your thinking is similar to those Super funds. But if you’re in retirement, and thinking 3.25% looks good, then make sure you’re aware of the consequences. If you need your capital back in the next 5 years, keep duration in mind. You could be selling at a massive capital loss (or a gain if rates are cut again). Because of the low default risk of 3, 5, 7, and 10 year government bonds they tend to have much lower yields than TDs. Therefore, they have not been very popular with individual investors to date. But, they do have strong defensive features. The corporate bonds XTBs cover have an average term to maturity of between three and four years. This means duration is not as relevant. You can still hold the bond just 3 years to maturity and receive the exact yield determined when you bought the XTB. Rate rises or falls don’t impact you if you hold to maturity. Corporate bonds are somewhat more risky than TDs for somewhat more return. Currently a portfolio of five XTBs on ASX offers an average yield of 3.5%4. A 6-month TD rate published by one of the four major banks on the same date was 2.2% (2.0% for monthly interest rather than end of the term). A return of 3.5% is more than 50% better than a return of 2.2%. CDIs are used to provide government bond returns on ASX. XTBs are used to provide corporate bond returns on ASX. CDIs are ‘depositary interests’ issued by an ASX subsidiary called CHESS Depositary Nominees. The underlying government bonds are held in an account in Austraclear (the CHESS of bonds), and ASX issues the CDIs in CHESS. This gives you an ASX-traded and CHESS settled CDI over the government bond. XTBs are units issued by an ASX-listed trust. The underlying corporate bonds are held in an account in Austraclear and the ASX-listed trust issues the XTBs in CHESS. This gives you an ASX-traded and CHESS settled XTB over the corporate bond. So legally they’re different, but conceptually they’re similar. Access to both government and corporate bonds was once the preserve of institutional and sophisticated investors. Both are now available on ASX to trade as you would shares and ETFs. Bonds provide defensive features for your portfolio. They provide strong capital stability compared with shares and hybrids. They also provide highly predictable income and returns. Over the last 10 years, bond returns have actually beaten share returns even though their risk is generally lower. However, as most advisers will tell you, the best securities portfolio approach is not all bonds or all shares, but a blend of asset classes.